Has the U.S. economy recovered? The slow economic recovery from the recession of 2007-09 continues, with forecasters generally projecting the U.S. economy will grow at an annual rate of about 3 percent in the coming quarters. They also foresee an improving jobs picture, although many Americans remain outside the job market and those who do have jobs have seen earnings stagnate. 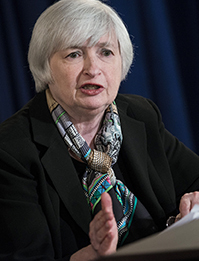 New Federal Reserve Chair Janet Yellen says she will follow the policy of her predecessor Ben Bernanke in tapering the central bank’s monetary stimulus program known as quantitative easing, but that she will keep the program going as long as the economy needs the boost. The European Union, the largest U.S. trading partner, is also beginning to show signs of recovery. The most recent job report numbers, while suggesting moderate growth on one level, send a mixed message upon closer examination. In early June, the Bureau of Labor Statistics (BLS) reported that the total number of civilian jobs in May was at an all-time high of 138.46 million.3 That marked the point when the nation recaptured all the jobs lost in the recession, although the population has also grown.4 It was the fourth month in a row that the economy added more than 200,000 jobs. Unemployment in May was 6.3 percent, unchanged from the previous month, and the lowest since September 2008. Will U.S. and overseas action stem the global crisis?